The latest Gartner market report on devices has received some press. And it shows a worldwide picture of smartphone market share that is quite different from what we are seeing on a daily basis with our EventPilot meeting apps. Smartphones remain a hot commodity with a double digit growth compared to last year and 1.4 billion units sold in 2015 alone! According to the Q4 2015 data, the Android OS is leading worldwide at 80.7% of devices being sold, followed by iOS at 17.7%. This made us curious as we have never seen this kind of distribution at professional events. We pulled our numbers from October through the end of January and it is very clear that science and medical professionals choose iOS. At our meetings, the majority being hosted in the US, 80% of all native event app downloads occur on iOS. In the USA in general, based on smartphone sales data by country for Q4 2016, iOS sales are closer to 40% and Android close to 60%. The tiny gap between the two leading operating systems has become negligible with Windows continuously losing market share. We also know from our event app statistics that more attendees use a smartphone than a tablet. 70-80% of our app users will be using the meeting app at a smaller screen and if they do bring a tablet, it’s more likely to be an iPad than an Android tablet. What does this all mean for a meeting planner? 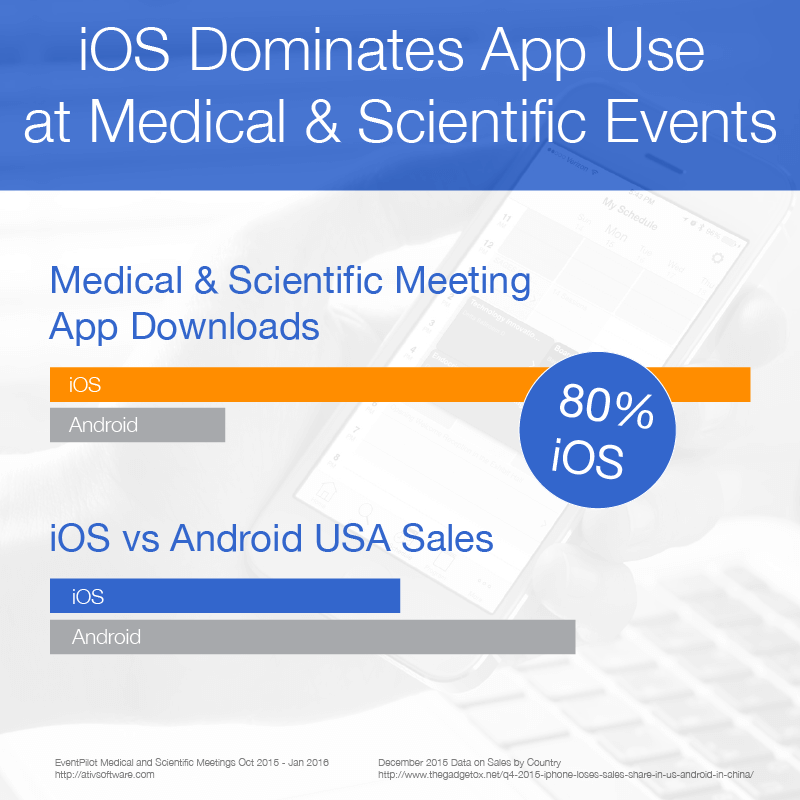 If you are planning medical meetings or scientific events, iOS on a phone screen will be the number one use case for your app, followed by Android smartphones. Ensure your app developer provides you with test versions for iOS in addition to Android, so you can review your apps before submission. Any problems with your iOS version would be magnified by the sheer number of users at your event. You’d want to catch issues before the app gets submitted to the store. All information should be included in the app so your staff can quickly and easily pull up details on sessions or exhibitors. When they then show an attendee the answer, its going to be more likely a device they are familiar with themselves. With more iOS users, you’d want to know how to quickly answer basic questions like “My daughter set up this phone for me. How do I retrieve my password?” We offer a handy knowledge base for our clients to look up the answers. Buy some sets of iPhone charging cables including the previous model’s charging adaptors. It’s easy to forget or lose your cable and Apple’s cables are not as ubiquitous as the standard Android USB cables.